Universal Advice to Abraham – Drop ‘Em! Description: A scathing attack on the ineptness and military ineffectualness of the Lincoln administration. The cartoon derives its title from an indiscreet letter written by secretary of war Edwin McMasters Stanton to past President James Buchanan immediately following the Union army’s defeat at the Battle of Bull Run. Stanton wrote, “The imbecility of this Administration, culminated in that catastrophe (Bull Run), and irretrievable misfortune and national disgrace never to be forgotten are to be added to the ruin of all peaceful pursuits and national bankruptcy, as the result of Mr. Lincoln’s `running the machine’ for five months.” William Pitt Fessenden (far left) cranks out greenbacks from “Chase’s Patent Greenback Mill.” Fessenden succeeded Salmon P. Chase as Treasury secretary. He says, glaring at the figures seated around the table, “These are the greediest fellows I ever saw. 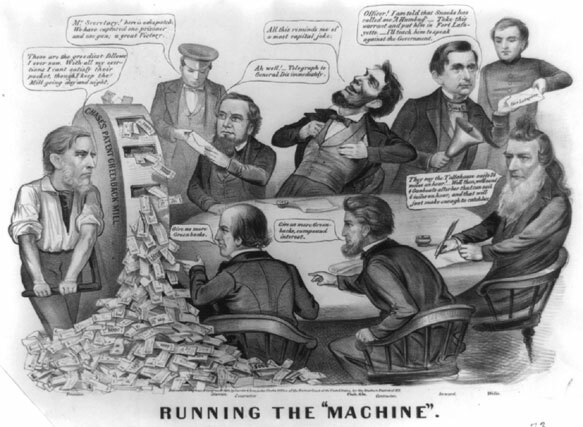 With all my exertions I cant satisfy their pocket, though I keep the Mill going day and night.” Seated at the table (clockwise from top left) are Stanton, Lincoln, secretary of state William H. Seward, Navy secretary Gideon Welles, and two unidentified contractors. At left a messenger hands an envelope to Stanton, announcing, “Mr. Secretary! here is a dispatch. We have captured one prisoner and one gun; a great Victory.” Elated over this minuscule achievement, Stanton exclaims “Ah well! Telegraph to General Dix [Union general John A. Dix] immediately.” Meanwhile, Lincoln is guffawing because he is reminded of “a capital joke.” (See “The Commander-in-Chief Conciliating the Soldiers Votes,” no. 1864-31, for the allusion.) Seward, with a bell in one hand, hands an envelope “Fort Lafayette” to a young officer or cadet, saying, “Officer! I am told that Snooks has called me ” Humbug’–Take this warrant and put him in Fort lafayette–I’ll teach him to speak against the Government.” Seward was criticized for arbitrarily arresting civilians and incarcerating them in federal prison at Fort Lafayette. Beside Seward Gideon Welles ineptly works out a problem. “They say the Tallahasse sails 24 miles an hour!–Well then, we’ll send 4 Gunboats after her that can sail 6 miles an hour, and that will just make enough to catch her.” At center bottom, the two contractors ask for more greenbacks.